After U.S. 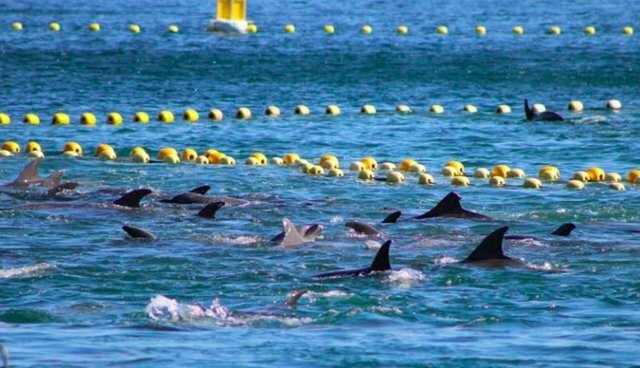 Ambassador to Japan Caroline Kennedy called out the annual dolphin slaughter at Taiji for its "inhumaneness," Japanese officials have been forced to publicly defend the practice. "Dolphin fishing is a form of traditional fishing in our country," he said, responding to a question about Ms. Kennedy's criticism. "We will explain Japan's position to the American side." While many in Japan argue that the hunt is a national tradition, Capt. Paul Watson, founder of the conservation group Sea Shepherd, maintains that the hunt is driven by "demand from marine aquariums." This killing method does not conform to the recognized requirement for "immediate insensibility" [some background is here] and would not be tolerated or permitted in any regulated slaughterhouse process in the developed world.